Dry-bulb Temperature Sensor is designed for use with economizers in climates with low humidity. With a changeover deadband of two degrees F, the C7660 microprocessor-based sensor enables economizers to activate or deactivate at a tighter temperature band for greater energy savings. 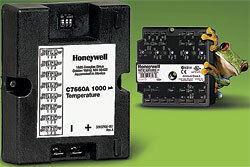 Also includes a changeover temperature dip switch and eight selectable temperatures.